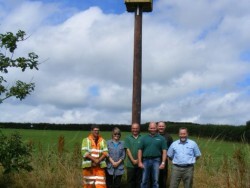 An outdoor polebox for Barn Owls can be provided almost anywhere – however it is the most expensive and least preferred option. 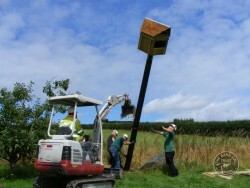 Indoor nestboxes are best – find out why. 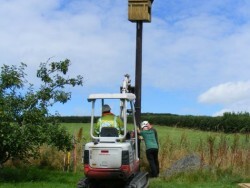 If a pole-mounted Barn Owl nestbox is your only option, the photos below show how to go about putting one up by a team using heavy lifting machinery, or alternatively, a digger with a strong chain could do the job. 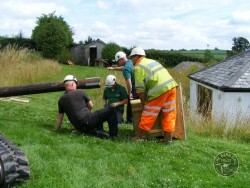 If no lifting equipment is available, follow our instructions on Putting up a pole-box by hand. 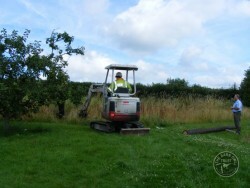 Select a position where the polebox will overlook open countryside. Dig the hole 1.5 metres deep. 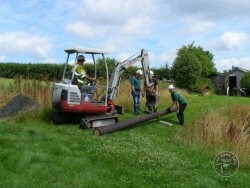 The pole needs to be 6 metres long. 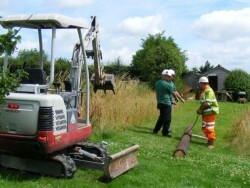 …the pole can be lifted by a strong chain attached to a digger. 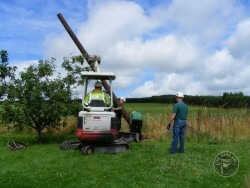 But before the pole is fully erected, attach the box with 4 galvanised brackets . Use coach screws to attach the brackets to the pole. 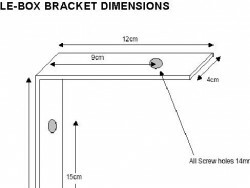 Use coach bolts and nuts to attach the box to the brackets. 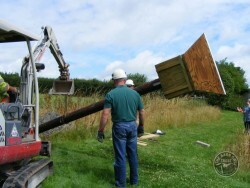 Erect the pole remembering to face the box the right way. 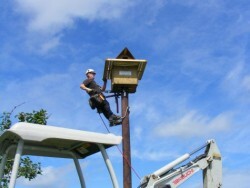 Climb to the box using pole climbing irons or a ladder to fix the exercise platform. Slide on both halves and secure with the side battens. A job well done! 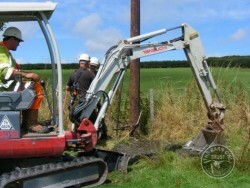 [thanks to Western Power Distribution]. 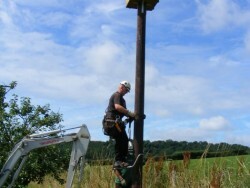 How to build a Barn Owl nest box for on a pole.